5%. Just 5%. When you think of losing 5% of your weight, it doesn’t amount to a lot of actual pounds (for a person who weighs 200 lbs, as an example, you’re talking 10 pounds). 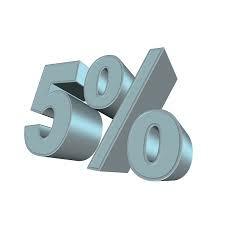 However, just committing to losing 5% can provide a wealth of health benefits! Here are some of our favourites! Did you know? Carrying around just 10 extra pounds adds 40 pounds more pressure to your joints. This can cause them to ache, pain and in some cases wear out. Losing even a little weight today can help alleviate issues tomorrow. Cancer. The big “C” word. One study showed that women who lose just 5% of their body weight can lower their chances of cancer by as much as 12%! Help prevent Type 2 Diabetes! Studies have shown that losing weight is one of the two ways to help prevent getting this type of diabetes. The other type? Moderate exercise: 30 minutes 5 days a week. And guess what? If you’re regularly exercising…. It’ll help you lose weight too! Lower those Triglycerides. What are they? They’re particles in your body that transport fat for storage and energy. High levels of these bad boys put you at a higher risk for heart attack or stroke. Lower blood pressure. Extra body weight makes the blood push harder against your artery walls, which in turn makes your heart work harder, and, you guessed it… raises your blood pressure. Studies have shown you can lower your blood pressure level by as much as 5 points by shedding 5%. Sleep longer and better! Studies have shown that not getting enough ZZZ’s can make you more likely to become overweight. Others have shown that losing at least 5% of your body weight can lead to better sleep. The bottom line? Sleep is a GOOD THING! Feeling blue? Better body image and improved sleep help make you feel better about yourself, which can help chase those blues away. These are changes that can last you long term too! The key to all of this is setting a realistic goal. Statistically, women tend to think their goal is 10% lower than it should be, while men tend to think their goal is 10% more than it should be. If you aren’t sure, the best advice is to ask your doctor! What other health benefits have you experienced with losing weight? We’d love to hear from you!